Mulch replacement or replenishment is one of the fastest ways to give your landscape an amazing look. But there are more benefits to mulch installation than just the aesthetic ones. Mulch ensures the long-term nourishment and protection for your flower beds, trees, shrubs, and other plantings. Mulch benefits your landscaping in several ways. The primary benefit is that it protects the soil from the sun, keeping the roots cooler and reduces moisture loss from evaporation. We recommend at least 3 inches of mulch for all landscapes, this amount of mulch properly protects the soil to keep it moist with minimal watering and has an added benefit of reducing weed growth. Depending on the type of mulch you choose for your property there may be additional benefits like natural pest repellent or natural fertilization. 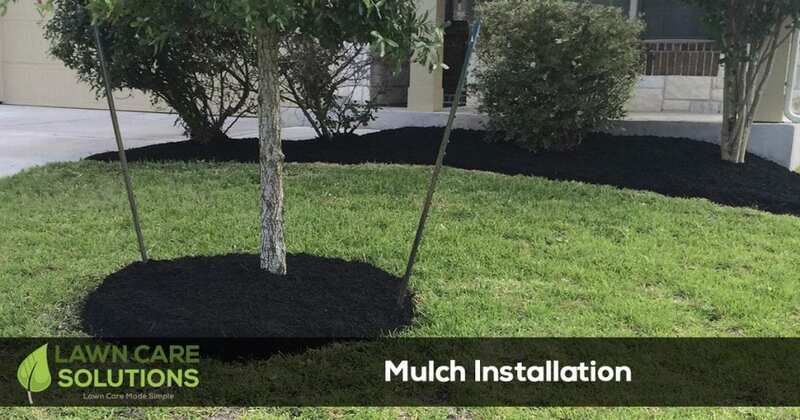 There are several types of landscape mulches available but the most popular is organic mulch which is shredded twice and made from recycled products. Once installed it will give great curb appeal to any flower bed. Here is a list of our most requested colors when it comes to mulch installations. Lawn Care Solutions provides mulch delivery and installation services in Austin, Buda, and Kyle Texas. All of our products are environmentally friendly, pet safe, non-toxic and biodegradable.